Undo and redo registry modifications (except changing permissions). 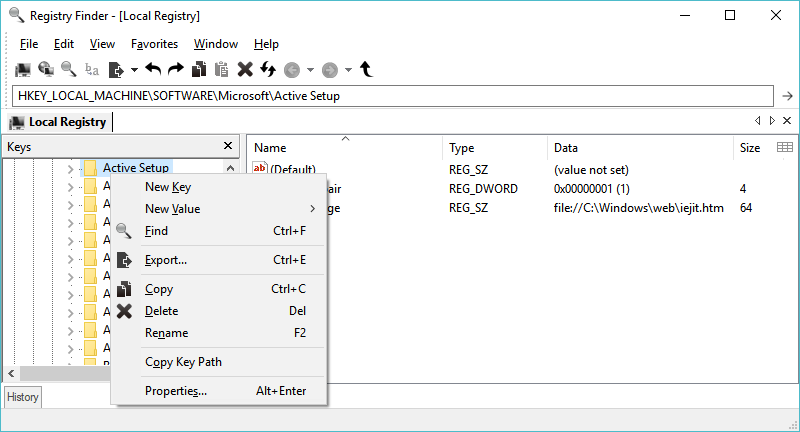 Multiple local and remote registry windows. Whole search results are displayed in a list. Ability to search within previous search results narrowing down your search scope. Ability to search for hidden keys. Registry Finder allows you to browse the local registry; create, delete, rename keys and values; modify values as its natural data type (string, multistring, DWORD) or as a binary data. It is allowed to open multiple Registry windows. Next time you start Registry Finder, those windows will be reopened on the same keys as before. The Find operation is efficient and quick. All found items are displayed in a separate window as a list. Each line represents a single match with the search criteria. The icon shows where the match occurred: key name, value name or value data. Matched text is highlighted with red. You can jump to any found item in the Registry window or edit/delete items right in the Find Results window. Items in the Find Results window can be saved to file in .reg or .txt format. In latter case, items are separated by tabulator. It allows easy data importing and analyzing in other programs, such as Microsoft Excel. With the Replace feature you can easily replace all or particular occurrences of one string with another. The replacement is performed only in items that are in the Find Results window. In the Replace dialog you specify either all items or just selected ones. After replacement is done, items in the window are updated. If some item do not match the search criteria any more it still remains in the list. All operations that alter the registry including deletion and replacement can be undone and redone. The operations are listed in the History window. To open it, click View|History in the main menu. The last performed operation is marked with a yellow arrow. Full name of the key can be copied to clipboard. Registry Finder can be used without installation. Just download archive with binaries, unpack it into any folder on HDD or USB drive and start the executable. The utility does not store any of its data in the registry. It stores settings in the RegistryFinder.config file located in the same folder as the executable. Another option is to download and run the installer. It contains both 32-bit and 64-bit versions of binaries, so you do not need to choose. The installer can deploy Registry Finder either in Normal mode or in Portable mode. The later just unpacks binaries into the folder you specify. The Normal mode performs standard things - unpack binaries, create shortcut in the Start Menu, create a desktop icon and make uninstallation entry in the Control Panel. One little difference is that in Normal mode the config file is stored in another place. Specifically, in the %APPDATA%\RegistryFinder folder. In some use cases the folder where Registry Finder stores its settings and undo history is not accessible for write. The most evident is running from a write-protected USB stick. In that case, Registry Finder is fully functional except that the undo history and application settings are not saved (so called No-Save mode). On startup, appropriate message is shown and the status bar contains a yellow triangle sign. Registry Finder has a number of command line parameters you can use to customize its behavior. --computerName arg	Specifies the name or IP address of a computer to connect to. --navigate arg	Specifies a registry key to navigate to. If this parameter is set to "clipboard" then the path is taken from the clipboard. --reopenLocal arg	Restore or not previously opened local registry windows when Registry Finder starts (arg: true or false, default is true). --reopenRemote arg	Restore or not previously opened remote registry windows (arg: true or false, default is true). --dataFolder arg	Specifies folder to store settings and undo history. Note 1. The parameter names are case sensitive. Note 2. There are additional parameters (displayed with --help) but they are left undocumented singe they are experimental and may not work as expected. Registry Finder supports searching so called hidden registry keys. These are the keys with the null character in the name. Such keys cannot be created, deleted, modified or viewed by standard Windows API, so they are not accessible by regedit and most other registry editors. 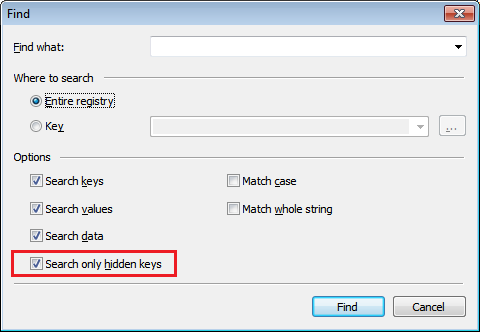 To quickly evaluate this feature, you can use the "Search only hidden keys" checkbox in the Find dialog. The downloaded archive contains the NReg utility that you can use to create and delete hidden keys for demonstration purposes. Type NReg -h to see the usage information. Windows XP, Vista, 7, 8, 8.1, 10 32-bit and 64-bit versions. In brief, this utility is released as freeware. You are allowed to freely distribute this utility via removable media, Internet, or in any other way, as long as you don't charge anything for this. Fixed possible hang up after deleting a favorites category. 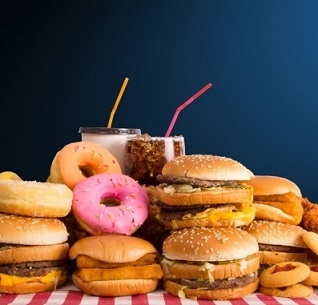 916 4,165 Sergey Filippov <img src="https://www.oldergeeks.com/downloads/gallery/thumbs/Registry Finder1_th.png"border="0"> Apr 08, 2019 - 11:42 2.34.1 3.11MB ZIP , out of 15 Votes.